2 Beds 1 / 1 / 0 Bath 1,360 Sq. ft. Description: Gorgeous custom home. 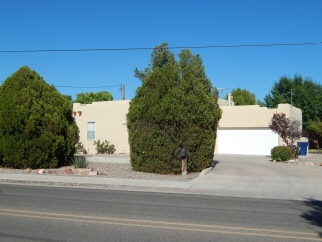 Great location in the heart of los lunas. Fabulous southwest style with loads of curb appeal. Features cathedral ceilings with beautiful wood beams. Enjoy cozy nights relaxing by the kiva gas-log fireplace in the great room. Two spacious bedrooms and 1-3/4 baths, gourmet kitchen with granite counter tops,, formal dining room, beautiful courtyard, walled backyard, covered patio, easy-care landscaping with large trees. Energy efficient hot water heat, plus your family can keep cool all summer long with refrigerated air conditioning. Natural gas, city sewer & city water. Two-car, finished attached garage. 2019 new synthetic stucco installed. Immaculate and ready for your family. Easy access to i-25 and minutes to albuquerque. Close to all city conveniences.